Most large telescopes have a 2” focuser. You can use this to your advantage by using a 2“ Barlow lens and discovering all the additional advantages this can offer. The Omegon 2” Barlow lens provides a good image with high contrast. The use of ED glass means that visible colour aberrations are reduced to a minimum with the image appearing substantially sharper. In addition, all lens surfaces have been provided with a green multi-coating to reduce reflections. The 2“diameter also allows you to insert your 2'” eyepieces into the Barlow, doubling their magnification. This saves the need to buy additional eyepieces. The large lens diameter also means you will notice no shadowing in the image. You can also use the Barlow lens for astrophotography. Especially for compact objects, sometimes more focal length is required in order for them to be seen at a reasonable size in the image. The big plus: There is also no shadowing apparent on small image format camera chips. Naturally, clear starry nights can be cold in summer. This often means there is no choice but to wrap up warmly. This Barlow lens has been designed with a high grip exterior to provide a good grip, meaning that it is easy to handle securely even with gloves on. One does not always need the focal length to be doubled. It is also possible to use just one section of this Barlow lens in order to get a magnification factor of something like 1.5x. 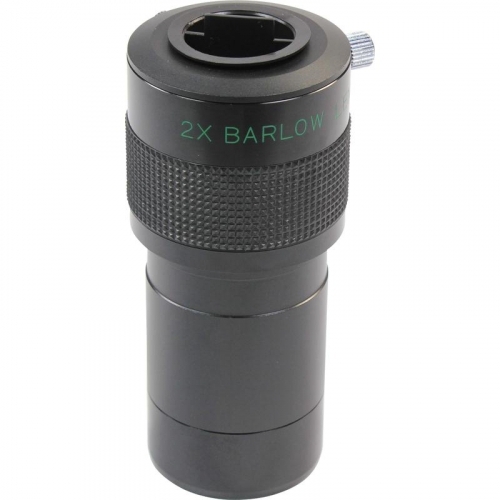 The lower Barlow element can simply be unscrewed and then screwed into any 2” eyepiece. This Barlow element is correctly threaded for this purpose. There is a 2“ filter thread provided on the lower part of the Barlow lens and on the reducer adapter for using your filters.